TEG is a technology that allows rapid analysis of whole blood clotting properties and assesses a patient’s overall coagulation status. TEG, along with ROTEM, is part of an overall effort to more rapidly evaluate bleeding patients (especially in the operating room and emergency department) to target the specific cause of their bleeding (please see the ROTEM entry for a discussion of the differences between TEG and ROTEM technology). TEG is performed on point-of-care instruments either in a clinical area (operating room most commonly) or in the laboratory, and a real time “tracing” is generated that helps guide potential transfusion therapy (see below). R-time (minutes); designated as “R” in the image above: The period from the start of sample placement in the cup to the initial fibrin formation. This component reflects the level of clotting factors. A prolonged R-time may suggest the need for plasma transfusion. 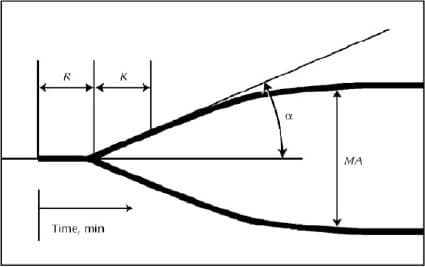 Angle (degrees); designated by the “alpha” symbol in the image above: Formed by the slope of the TEG tracing from the horizontal line. This component reflects the presence or absence of fibrinogen. A decreased Angle may suggest the need for fibrinogen supplementation (in the U.S., that need would typically be supplied by a cryoprecipitate transfusion). Maximum amplitude (millimeters); designated as “MA” in the image above: The height of the TEG tracing from the horizontal line. This component reflects the strength of the developed clot contributed mainly by platelets but also fibrin. A low MA may suggest the need for platelet transfusion). While not shown on the tracing above, TEG will also typically analyze the amount of clot lysis at 30 and 60 minutes (“LY30” and “LY60,” respectively). This measurement helps detect fibrinolysis. Use of TEG has been shown to decrease transfusion substantially in appropriate clinical settings. Written by Dr. Tuan Le, 2011; updated by Joe Chaffin, 2018.